As general assemblies in Maryland and Virginia convene this week, sexual harassment — and how the states' legislators police themselves — is one of the top issues some lawmakers hope to tackle this session. WASHINGTON — State legislatures in Maryland and Virginia have largely avoided the sexual harassment scandals that have erupted in state capitols around the county this year. Still, state lawmakers in both states are calling for changes to better protect legislators, their aides, interns and lobbyists from sexual misconduct. “It is high time that the conversation occur about sexual harassment in Annapolis, in Hollywood, in Congress, and in newsrooms and boardrooms around the country,” said Cheryl Kagan, who represents Gaithersburg and Rockville in the Maryland Senate. Conversations about how to handle complaints and alleged misconduct by members are taking place in the halls of both general assemblies as the legislative sessions begin this week. The Senate and the House chambers in both Virginia and Maryland have written sexual harassment policies. And lawmakers in both states are mandated to receive sexual harassment training, according to nationwide data compiled by The Associated Press. In Maryland, state legislators receive the training once per term, or every four years. 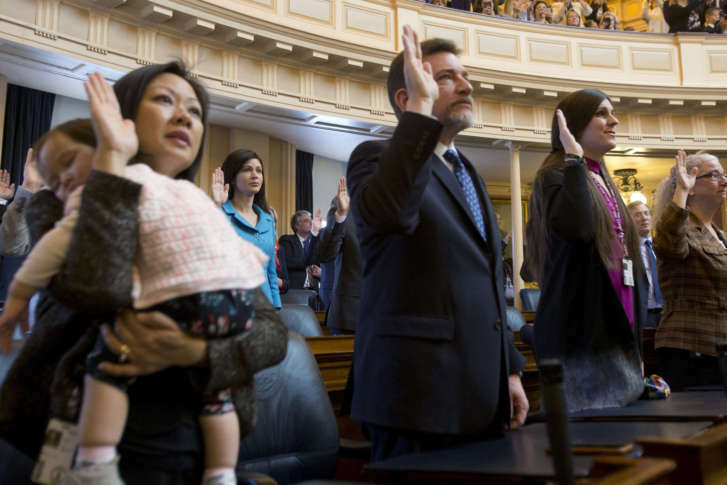 Virginia legislators receive the training just once following their initial election. Complaints filed against lawmakers are not investigated by an outside agency in either state, according to the data compiled by the AP. D.C. council members and staff will complete harassment training that Mayor Muriel Bowser ordered last month for all District employees. Additional training for the council is being planned, said council spokesman Josh Gibson. The council adheres to the District’s recently updated policy, which states that each agency must designate an employee to receive and investigate any complaints of misconduct. Employees will receive updated training every two years. The policy also calls for advanced training for supervisors. In comparison, about 20 percent of state legislative chambers nationwide require no sexual harassment training about what constitutes sexual harassment and how to prevent, report or investigate it, the AP data showed. And a majority of legislative chambers do not require external investigations of sexual harassment complaints, instead relying on legislators or their staff to handle such reports. Roughly three-quarters of states have at least one legislative chamber that has either updated its sexual harassment policy in the last three months, developed specific proposals or undertaken a review of whether changes are needed. 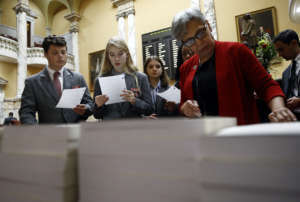 Maryland will start tracking harassment complaints and will provide a report of what complaints were filed and the outcome annually. In December, the Legislative Policy Committee voted to update the sexual harassment policy enacting those and other changes. Women lawmakers in Maryland say that is a good first start, but they have plenty of other recommendations that could improve the statehouse culture, not just for lawmakers but for the entire State House community, said Maryland Del. Ariana Kelly. “Our goal is to make Maryland the most women-friendly place to work in politics in the country,” said Kelly, who also leads the Women Legislators of Maryland. For example, she’d like the once per term training to incorporate scenarios that are relevant to the legislature — such as interactions in committee meetings or receptions. The current training doesn’t do that, she said. Kagan wants more transparency and accountability. She said that an independent office should receive and investigate any misconduct claims. And she’d like to see a range of disciplinary options — including that careers could be on the line for the most egregious misconduct. In Virginia, Del. Roxann Robinson, who represents Chesterfield County, wants state lawmakers and legislative branch employees to receive annual harassment training. And she’s filed legislation that would make that change. Northern Virginia Sen. Barbara Favola supports the idea of annual training, and she said the bill should receive unanimous support in both chambers. She credited the culture in the Virginia Capitol to the tenacity of the women who preceded her and who demanded such treatment. A flood of new female lawmakers joined the ranks of the House this session after a historic election in November driving the number of women serving in the 100-member body from 17 to 27. Ten women currently serve in the 40-member Senate. In Maryland, the ranks of women legislators are equally small — 11 in the Senate and nearly a third in the House. But women are running for State House seats in record numbers this year, and Kagan hopes that will result in a more diverse legislature and ultimately snuff out sexual harassment in the halls of power. WTOP’s Kate Ryan contributed to this report from Annapolis. The Associated Press also contributed to this report.